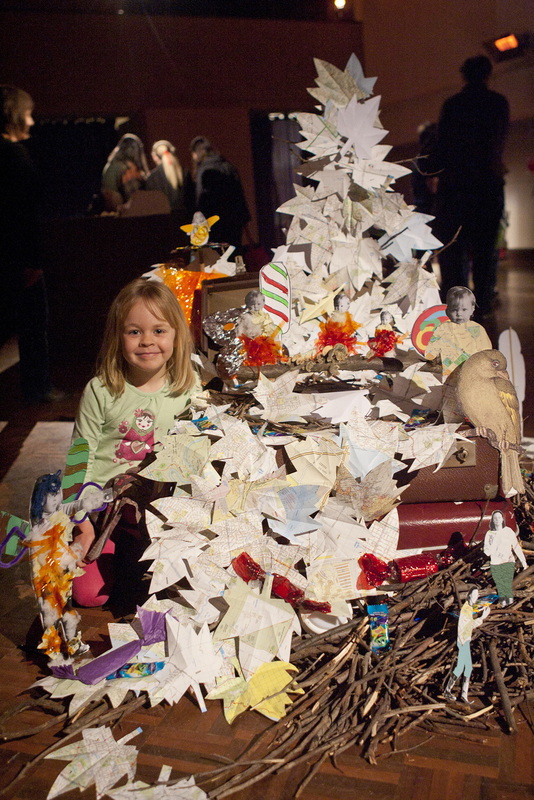 PARTICIPANT ARTISTS: Parent / Child pairs that had been touched by the 2009 bush- fires. In 2010, Polyglot engaged me to lead Our Place in Healesville. The Shire of Yarra Ranges had identified this community bushfire program as one that will build connection and focus on the idea of families and belonging in their region for people affected by the February 2009 fires. Our Place was a 10-week workshop process from 17 July to 18 September 2010, where parent/child couples met every Saturday morning for a session together to generate visual ideas of people in different environments, ideas of identity and connection. The unique part of the process was designing activities that allowed the space for the children to lead the parent in exploration and for both to be valued as equal members of their creative partnership. This cross generational project resulted in the creation of a series of beautiful installations in the Memorial Hall in Healesville. The exhibition featured the creations of 10 pairs of child and parent participants which were developed in old pieces of furniture, and which melded fantasy locations with favourite places and experiences.